(Michael King, Jr.)Martin Luther King, Jr.- MLK was one of the most powerful people who helped abolish segregation and helped African Americans get equal rights. He is considered the biggest hero in the African American Civil Rights Movement.He was born on January 15, 1929 in Atlanta, Georgia. Michael King Sr. and Alberta Williams King are the parents of Dr. King. Martin’s dad was also a pastor at Ebenezer Baptist Church. Martin had a older sister,Willie Christine, and a younger brother, Alfred Daniel. He grew up in Atlanta Georgia and attended public school at age 5. For high school Martin learned at Booker T. Washington. In high school he was considered “one of the smartest students” and skipped ninth and eleventh grades. He attended Morehouse College in Atlanta at age 15. During his college education he wanted to follow his father's footsteps into as a minister and studied the Bible. At Morehouse College he got a sociology degree. After he had finished and graduated from Morehouse College in Atlanta, he wanted to learn at Crozer Theological Seminary. There he graduated and went moved to Boston and studied again at Boston University. Finally after he finished graduating from three different colleges, He moved to Alabama and became a minister at a Baptist Church in Montgomery. After a couple of years living in Montgomery, Martin Luther kIng Jr. decided to travel to India for a visit. There he was spent most of his time learning about Gandhi's work. He discovered that he was inspired by Gandhi completely. When Martin returned to Alabama, he had an idea of being a civil rights leader like Gandhi. He wanted to stop racism and segregation between african americans and white people. So he started a boycott about the topic of segregation on public buses. Martin Luther King's power for this boycott was so strong that the governement listened and stopped separation of blacks and whites on buses. The african american community knew who they can depend on and choose as their leader. Later he married Coretta Scott and had four kids. There names are Martin Luther King iii, Bernice King, Yolanda King, and Dexter Scott King. He continued and continued to fight for him and his people. He didn't quit until the job was done. He was awarded serveal awards such as: The Noble Peace Prize, American Liberties Medallion, and the Presidential medal of Freedom. Later Dr. King was in Memphis, Tennessee giving a speech. Right after he finished giving a speech he headed back to his motel. While in his hotel, he went outside in his balcony and was was shot. He died on April 4th, 1968. MLK is considered a martyr. This is because he didn't just fight for civil rights, he put his life in danger so that the future will be better. This is considered a real hero with moral courage. He changed the way we live today. MLK showed moral courage in a huge way to everyone around the world. He is a great role model to follow and to be inspired by. King showed moral courage by not giving up. For example he was arrested about 30 times and that didn't stop him from giving up on what he started. He knew what was right. Martin Luther King Jr. would not stop fighting for his goals and accomplishments until they were met. He would fight until death, and that is what he did. He learned his strategies from Gandhi's story and was very inspired by him and considered him his hero. He wanted to make a difference and now people are inspired by him and are honor his work very much. He also showed moral courage by not being violent. He is known for being a peaceful leader. He learned that the best way to fight is not with you hands. The only thing he used to fight were signs and words. This person made a huge impact in the whole world. If you ask someone from Italy who MLK, he or she will probably know. If you ask someone in South Africa, they will probably know as well. He made such a big role in the US that nobody could ever forget him. MLK was motivated to lead and gain civil rights for african americans in the Untied States of America. There were specific core values that motivated him such as peace, patience, leadership, bravery, and commitment. Martin Luther King wanted to be a hero and show moral courage because he was tired of being treated unfairly because of his color. He wanted racism to stop. He wanted to show the world that black people can be heroes as well. 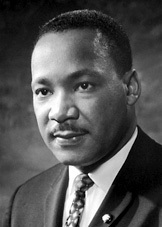 King always wanted to be a civil rights leader and especially right after he returned from India. He saw that Gandhi showed moral courage and that was important for him to show too. MLK showed moral courage because he wanted to make a difference and be a hero that showed moral courage. 1986 President Reagan assigned a national holiday in honor of Martin Luther King, Jr.
King leads a march of 250,000 people to Washington D.C. He said his famous " I have a dream" speech there. Martin Luther KIng, Jr. is the youngest person to receive the Nobel Peace Prize.